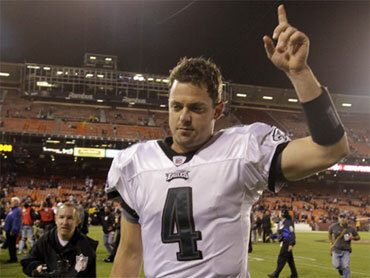 Although Kevin Kolb only talks about teamwork and selflessness, the Philadelphia quarterback's every move at Candlestick Park demonstrated he won't just give the Eagles' starting job back to Michael Vick. Alex Smith is desperate to hold on to his job in San Francisco, too - especially after leading a dynamic late rally that fell just short for the winless 49ers. Kolb passed for 253 yards while capably filling in for the injured Vick, and Quintin Mikell returned Smith's fumble 52 yards for a touchdown early in the fourth quarter of the Eagles' 27-24 victory Sunday night. Philadelphia (3-2) scarcely missed a beat with Kolb making his fourth career start in place of Vick, who hurt his ribs in last week's loss to Washington. The 49ers sacked Kolb four times, but he capably managed the offense during a 21-for-31 performance, hitting tight end Brent Celek for an early score and leading a late drive for David Akers' second field goal and the winning points. "Across the board, I thought we did a good job of matching their intensity and finishing up there in the fourth quarter," Kolb said. "We made it happen when it counted in every aspect of the game." Kolb was the Eagles' starting quarterback out of training camp, but sat out with a concussion after the opener while Vick was chosen the NFC's offensive player of the month for September. Kolb even made a Vick-ian scramble on a third-and-18 play in the third quarter, faking a throw and darting between San Francisco's tacklers as if they were traffic cones before diving forward for a first down. "He did it with conviction," Philadelphia coach Andy Reid said. "I thought he stepped and played like we know he can play. The guys have so much confidence in him. Everyone was right with him." LeSean McCoy rushed for 92 yards while playing with a broken rib, and Trevard Lindley made a last-minute interception for the Eagles, who forced five turnovers and survived San Francisco's 14-point surge in the final minutes for their fifth straight win over the 49ers (0-5). McCoy made a 29-yard scoring run shortly before halftime for the Eagles, who stayed even with Washington and the New York Giants atop the NFC East by winning their first three road games of a season for the first time since 2004. Philadelphia's defense yielded 364 yards, but repeatedly made big plays to keep the 49ers' talented offense at a level of high frustration. "They turned the ball over so much," McCoy said. "They would drive down the field and couldn't finish. We just focused on closing the game out, and we counted on our defense to bail us out at the end." INDIANAPOLIS (AP) - Mike Hart scored the game's only touchdown on an 11-yard run with 4:02 to go and the Indianapolis Colts handed the Kansas City Chiefs their first loss of the season 19-9 on Sunday, leaving the NFL without any unbeaten teams. It's the first time since 1970 that no team has reached 4-0. The Colts (3-2) won in atypical fashion. For the first time this season, Peyton Manning failed to top 300 yards or throw for a touchdown. He finished 26-of-44 for 244 yards with one interception and couldn't get the Colts into the end zone until Hart's clinching score. Hart replaced Joseph Addai midway through the third quarter with what appeared to be a right shoulder injury. He did not return. Jamaal Charles carried 16 times for 87 yards, and Matt Cassel was 16-of-29 for 156 yards for Kansas City (3-1) Ryan Succop kicked three field goals. The Chiefs opened the game with an onside kick, but the ball never traveled the required 10 yards. The Colts took possession and Adam Vinatieri opened the scoring with a 20-yard field goal. GLENDALE, Ariz. (AP) - Max Hall's debut as Arizona's quarterback was a winning one as the Cardinals defense intercepted three passes by Drew Brees. The undrafted rookie from BYU completed 17 of 27 passes for 168 yards, Jay Feely kicked three field goals and Kerry Rhodes returned a fumble 27 yards for a score to lead the way. Hall threw an interception that led to an early Saints field goal and fumbled twice, but both turned out to be key plays for Arizona (3-2). The first was returned 2 yards by Cardinals tackle Levi Brown for a touchdown. Guard Alan Faneca pounced on the other for a 10-yard gain. Arizona's defense, awful in a 41-10 loss at San Diego a week earlier, converted two turnovers by the Saints (3-2) into touchdowns. OAKLAND, Calif. (AP) - Michael Bush ran 3 yards for the go-ahead touchdown with 3:39 remaining and Tyvon Branch returned a fumble 64 yards for a score as Oakland snapped a 13-game losing streak against San Diego. All it took to end the seven-year drought for the Raiders (2-3) was two blocked two punts, two long touchdown drives in the second half led by backup quarterback Jason Campbell and the big play at the end by Branch and Michael Huff. This was Oakland's first win over San Diego (2-3) since September 2003 - which was the second longest active streak to Buffalo's 14-game losing streak to New England. With the Chargers driving for the potential go-ahead score, a blitzing Huff hit Rivers just before his arm went forward, knocking the ball loose. Branch picked up the ball and raced 64 yards for the score to make 35-27 with 58 seconds left. ARLINGTON, Texas (AP) - Chris Johnson scored a pair of 1-yard touchdowns in the fourth quarter, lifting Tennessee over mistake-prone Dallas. The Cowboys got behind 17-3 with penalties and errors on defense. Dallas managed to tie it at 17 and 20, then a tipped pass that was intercepted set up Johnson's first touchdown of the final period. Tony Romo tied it again at 27 on a touchdown throw to Jason Witten, then offensive lineman Marc Colombo was penalized 15 yards for celebrating. Dallas (1-3) kicked off from farther back and Tennessee's Marc Mariani returned it to the 11. A penalty on the tackle moved the ball to the 5, setting up Johnson's next touchdown. The Titans (3-2) won their 11th straight against an NFC team, the NFL's longest active non-conference win streak. DETROIT (AP) - Stefan Logan's 105-yard kickoff return broke a tie and sent the Lions to their first win of the season and ended a 10-game losing streak. The win was the Lions' most-lopsided since beating the expansion Jacksonville Jaguars 44-0 in 1995. The Rams (2-3) lost standout receiver Mark Clayton with an injured knee in the first quarter and limited rookie Sam Bradford's passing options - he was 23 of 45 for 215 yards with two interceptions. Shaun Hill threw for 227 yards and connected with Calvin Johnson, Brandon Pettigrew and Nate Burleson for touchdowns. BALTIMORE (AP) - Ray Rice ran for 133 yards and two touchdowns, and Baltimore frustrated Denver quarterback Kyle Orton. Baltimore (4-1) jumped to a 17-0 lead and coasted to its third straight win, the first this season by double digits. The Ravens moved past idle Pittsburgh into sole possession of first place in the AFC North. The Broncos (2-3) fell to 0-5 against the Ravens in Baltimore. In those games, Denver has been outscored 142-56, including 60-24 over the last two years. Orton completed his fourth straight 300-yard passing game with a 44-yard touchdown pass to Brandon Lloyd with 35 seconds left. It was of little consolation to the Broncos, who hurt themselves by losing a fumble and committing 10 penalties for 90 yards. Baltimore's Joe Flacco completed 14 of 25 passes for 196 yards and ran for a score. HOUSTON (AP) - Eli Manning threw two of his three touchdown passes to Hakeem Nicks and the Giants held Houston to a franchise-low 24 yards rushing. Nicks finished with career highs of 12 catches and 130 yards, another big day for a receiver against the Texans' porous secondary. Manning finished 27 of 42 for 297 yards, and threw his third TD pass to Steve Smith in the fourth quarter. Osi Umenyiora sacked Texans quarterback Matt Schaub twice and also forced a fumble for the Giants (3-2). New York held NFL rushing leader Arian Foster to 25 yards on 11 carries. Linebacker Brian Cushing made four solo tackles in his season debut for Houston (3-2). Cushing was suspended the first four games for violating the NFL's policy on banned substances. LANDOVER, Md. (AP) - Graham Gano kicked a 33-yard field goal 6:54 into overtime to lift Washington. The winning score was set up by LaRon Landry's diving interception of Aaron Rodgers at the Packers 39. The Redskins moved the ball with the help of two penalties to set up Gano's kick. Washington overcame a 10-point fourth-quarter deficit, tying the game on Gano's 44-yard field goal with 1:07 to play. Green Bay's Mason Crosby hit the left upright from 53 yards with 1 second left in regulation. CHARLOTTE, N.C. (AP) - Matt Forte rushed for 166 yards and two touchdowns, Julius Peppers had an acrobatic interception against his former team and Chicago overcame four interceptions by backup Todd Collins to keep Carolina winless. Forte scored both his TDs in the first quarter, during which Peppers silenced a booing crowd in his first game back to Carolina with a diving interception to set up a field goal. The Bears (4-1) bounced back from an ugly loss a week earlier against the Giants to do just enough to beat the Panthers (0-5), who again couldn't move the ball with Jimmy Clausen at quarterback. With Jay Cutler sidelined with a concussion, Collins threw for just 32 yards before being benched for Caleb Hanie. CLEVELAND (AP) - Defensive end Kroy Biermann's spectacular interception return for a touchdown in the fourth quarter led Atlanta. After pressuring Browns quarterback Jake Delhomme, Biermann leaped to deflect the pass and then made a diving headfirst catch like a seasoned wide receiver. Knowing he had not been touched, Biermann scrambled to his feet and rumbled 31 yards on a twisting, turning effort to give the Falcons a 20-10 lead with 4:01 left. Matt Ryan threw a 45-yard TD pass to Roddy White as the Falcons (4-1) won their fourth straight. Michael Turner rushed for 140 yards. The Browns (1-4) lost starting quarterback Seneca Wallace just before half with an ankle injury. Cleveland picked up just 48 yards rushing. ORCHARD PARK, N.Y. (AP) - Tight end Marcedes Lewis caught two touchdowns passes as Jacksonville rallied from a 10-point deficit to keep Buffalo winless. David Garrard shook off an interception and a lost fumble to throw for three touchdowns as the Jaguars (3-2) snapped a four-game road skid. Mike Sims-Walker's 7-yard touchdown put the Jaguars ahead for good, 27-20 lead late in the third quarter. Lewis scored on 1- and 27-yard receptions to give him five TDs on the season, breaking the Jaguars' franchise record for scores by a tight end. Josh Scobee made all five field-goal attempts. The Bills squandered 10-0 and 13-3 leads, and are 0-5 for the fifth time in franchise history, the first since 1985. Buffalo has allowed 30 points in four straight games for the first time. CINCINNATI (AP) - Carson Palmer's third interception gave Tampa Bay one last chance, and Connor Barth kicked a 31-yard field goal with 1 second left.